The Great Christmas Light Fight is back! This week, ABC announced the TV show’s sixth season will debut in November. The competition series sees “four families from all around the country decorate their homes to the extreme in the hopes of winning the coveted Light Fight trophy and a $50,000 prize, with a total of $300,000 given away for the season.” Celebrity judges include lifestyle expert Carter Oosterhouse and interior designer Taniya Nayak. 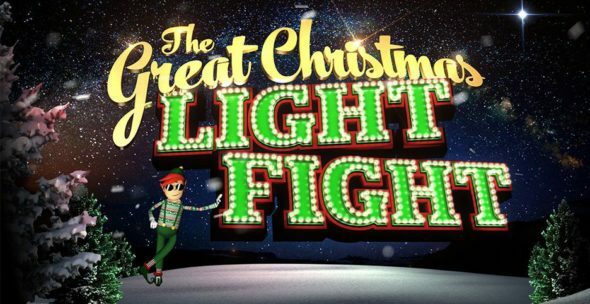 Season six of The Great Christmas Light Fight premieres on ABC on November 26th at 8 p.m. ET/PT. Additionally, the series will return for a seventh season in 2019. The holidays are about to get a whole lot brighter with ABC’s immensely popular decorating competition series, “The Great Christmas Light Fight,” premiering MONDAY, NOV. 26 (8:00-10:00 p.m. EST). Produced by Fremantle, the hit holiday series is back for a sixth season with returning celebrity judges: lifestyle expert Carter Oosterhouse and interior designer Taniya Nayak. ABC also announced the pickup of Season 7 to air in 2019. Season 6 of “The Great Christmas Light Fight” showcases the wildest and most spectacular Christmas displays in America. In each one-hour episode, four families from all around the country decorate their homes to the extreme in the hopes of winning the coveted Light Fight trophy and a $50,000 prize, with a total of $300,000 given away for the season. This season, as the temperature cools down, the competition heats up when families invite us from out of the snow inside their homes to witness their fantastic Christmas décor for the very first time. In addition to all of the stunning inside/outside displays, the first ever “Heavyweights” episode will showcase light shows that have grown too large for any home. Carter Oosterhouse is one of America’s most recognized lifestyle experts. He recently helped kick off the “Trading Spaces” reboot earlier this year and has already begun filming Season 2. Oosterhouse provides green-building solutions and design alternatives that conserve energy and reduce environmental waste to each renovation project. He has become a go-to expert for many national outlets including “Rachael Ray,” Men’s Health, “The Today Show,” “The CBS Early Show,” “The Oprah Winfrey Show,” “The View,” “Entertainment Tonight,” “Extra,” USA Today and The Los Angeles Times. Taniya Nayak is the creative vision behind some of the most exciting new restaurant interiors and high-end residences across the country. She has appeared on “Good Morning America,” HGTV and Food Network, and is a regular guest on the “Rachael Ray” show. New projects include New England hot spots Lower Mills Tavern, Yellow Door Taqueria and several locations of Ruth’s Chris Steak House, as well as a home for Boston Bruins star Patrice Bergeron and an office for Ayesha Curry. What do you think? Are you a fan of The Great Christmas Light Fight? Will you watch the new season? More about: ABC TV shows: canceled or renewed?, The Great Christmas Light Fight, The Great Christmas Light Fight: canceled or renewed? Please renew for a second season! Such a great show. The story is fascinating and the characters are terrific. I look forward to it every week! yes, i like watching it….too many lights for my liking , but the show is good !